Apeiron® Data Systems, Inc., the inventor of NVMe™ over Ethernet (NoE) technology and Direct Scale-out Flash (DSF) announced today that the Enterprise Strategy Group (ESG) has completed their review of the Apeiron performance testing. This third party validation is critical considering how disruptive this advancement is to the NVMe SSD market. The ESG Lab Spotlight paper provides an overview of the DSF architecture and validates the incredible scalability and ultra-low latency of the ADS1000 integrated network. This testing proves the system delivers performance equal to or better than direct attached NVMe storage. The critical difference is the fact that the system scales to thousands of drives and hundreds of servers without a drop in performance. ESG proved that IOPS, latency, and throughput comparisons were all indistinguishable between an internally installed NVMe SSD and a networked Apeiron drive enclosure. In fact, as workloads and queue depths increase the Apeiron network actually out-performs the captive storage across all categories. The ability to provide integrated storage switching across multiple enclosures and servers, with zero performance penalties, means that businesses can bring NVMe out of the silos typical of scale-out architectures. Petabyte scale pools of high performance NVM, can now be allocated to huge number of servers. Each ADS1000 enclosure has a fully integrated 32-port switch, so there are no external fabrics to procure and manage. With high performance virtual LUNs, the CPU is optimized, and in many cases realizes an 80%+ boost in performance. The elimination of external switching and the ability to optimize the CPU provide the ADS1000 with a powerful ROI/TCO advantage. The system is comprised of a 2U drive enclosure, containing 32 ports of 40GbE and 24 NVMe SSDs. Any NVMe SSD manufacturer is supported. This multi-vendor approach eliminates the risk of single source proprietary solutions. The customer is free to choose the proper NVMe drive profile for their workload. Apeiron is ready for the future as well, with connectivity on day-one to Intel’s next generation NVMe drives; using 3D XPoint™ technology. With a fully integrated fabric capable of scaling to thousands of drives, extreme performance on massive workloads is now possible. Businesses can now create performance-focused NVMe networks capable of truly leveraging the next generation of Hadoop, Spark, Splunk and other big data applications requiring massive datasets. Apeiron’s Direct Scale-out Flash platform enables lower capital and operational costs through the consolidation of servers and external switching. This enables more performance in a smaller footprint—and as NVMe drive densities and performance increase in the future, the Apeiron advantages will increase in kind. "Apeiron's ADS1000 extends the low latency potential of NVMe with the benefits of scale-out pools of networked storage that leverage Ethernet infrastructure," said Scott Sinclair Senior Analyst at Enterprise Strategy Group, Inc. "If you were to project how NVMe technology would penetrate the data center, you would picture something like Direct Scale-out Flash." 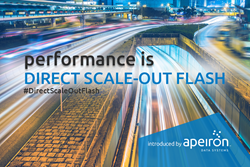 Apeiron Data Systems Direct Scale-out Flash platform delivers the world’s only native NVMe™ storage network, based on standard Gigabit Ethernet components. The ADS1000 provides unmatched performance, scalability and flexibility. The ability to leverage standard NVMe SSDs ensures our customers can make the proper SSD platform decisions, based on their applications’ needs and not supplier limitations.